The Professional Staff Congress (PSC) picketed in favor of Open Admissions, among other things, in front of Baruch College in February 1973. Their efforts to save Open Admissions from budget cuts presaged the struggles that would come with fiscal crisis of the mid 1970s. 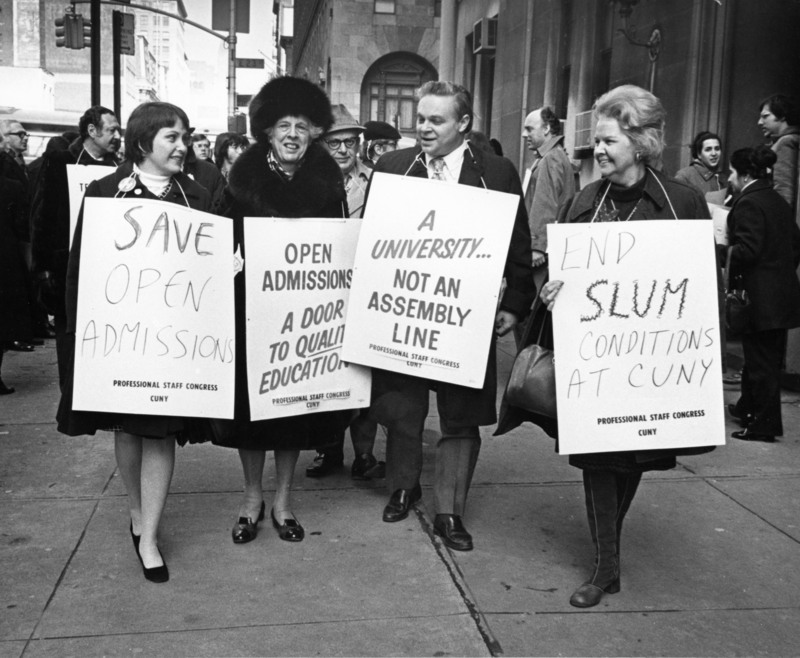 While Open Admissions added many new students to CUNY after 1970, both New York State and New York City sought to cut funding for CUNY in the subsequent years. The PSC argued that this would degrade education for all students. Belle Zeller, PSC president, is second from the left, with Arnold Cantor, PSC’s Executive Director, to her right. Cite This document | Unknown, “Picketing at Baruch College,” CUNY Digital History Archive, accessed April 18, 2019, http://cdha.cuny.edu/items/show/3442.